How people imbued supernatural action into events to position themselves in their social landscape. This article analyzes two miracles, which a fragment of the True Cross performed for the Venetian confraternity of San Giovanni Evangelista in the late fourteenth and early fifteenth centuries. 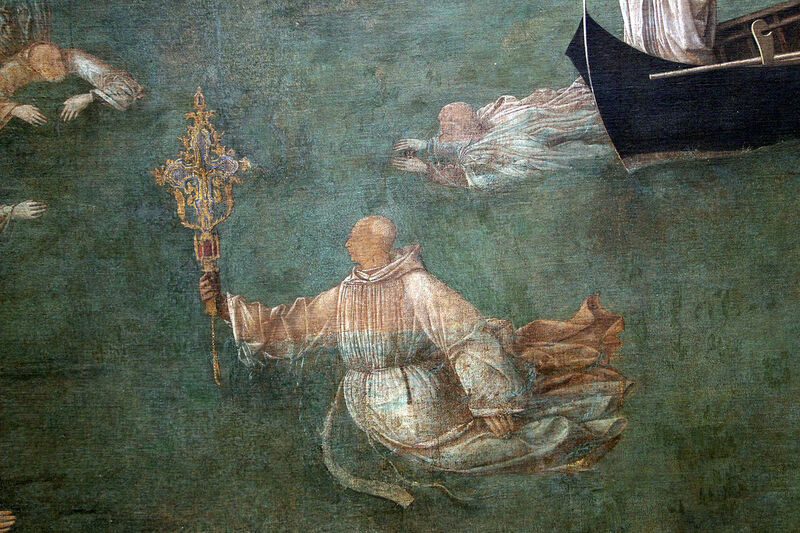 Unlike most such feats bearing a strong spiritual message, the miracles at the bridges of San Lorenzo and San Lio had a marked social context. 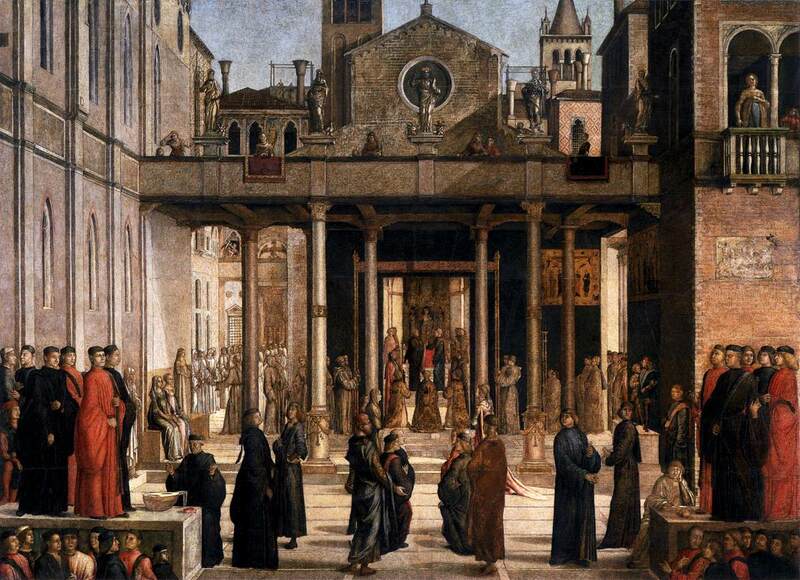 The breaking of the supernatural into everyday life inserted the numinous agent onto a stage where three major dimensions of late medieval and Renaissance Venetian society –personal, confraternal, and civic– intersected and arranged their relationships in a continuously shifting social and political environment. The scrutiny of the miracles and their renditions in text and image allows us a glimpse into the meanings with which individuals (in the persons of Andrea Vendramin, Gentile Bellini and Giovanni Mansueti), the group (the confraternity of San Giovanni Evangelista and the Vendramin family), and society (represented by the civic authorities) imbued the supernatural action to position themselves in their social landscape. Sometime in 1370, the Venetian confraternity of San Giovanni Evangelista, having recently acquired a fragment of the True Cross, took it out on one of its regular processions around the city. The Cross was a powerful artifact and the brothers were eager to display their devotion to it and enhance the honor of the scuola and the Serenissima. 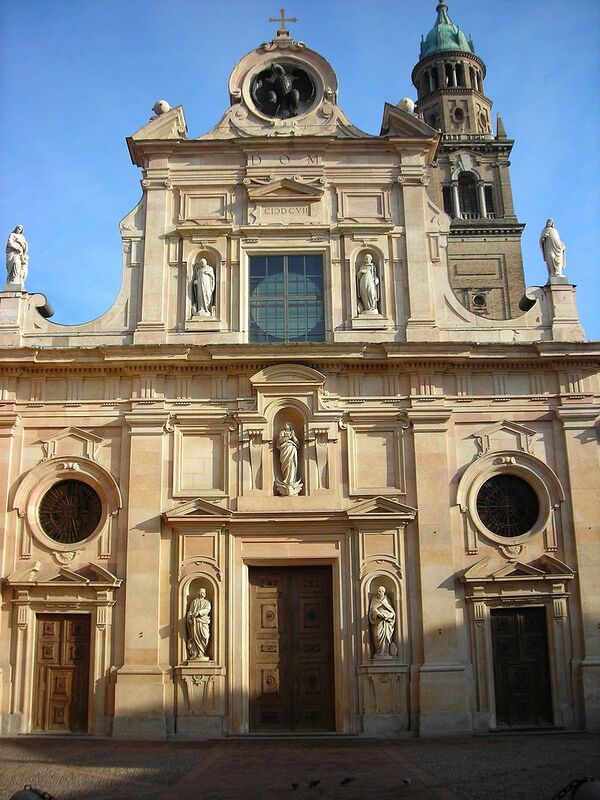 It was the feast day of San Lorenzo and the saint’s church was the destination point. At the narrow bridge just before the church, the dense crowd pressed the cross-bearer too hard. He lost his balance, and the precious relic tumbled down over the parapet. However, the Cross did not sink in the canal. It hovered over the murky waters sustained by the invisible power of the divine. The astonished brothers, some lay onlookers, and a priest of San Lorenzo’s attempted to retrieve it, but the Cross defied them. Only when the scuola’s Guardian grande, Andrea Vendramin, threw himself in the canal did the Cross graciously move his way and allowed itself to be rescued. It was a clear miracle, and a great number of people witnessed it with their own eyes. To make sure that this poignant lesson was not lost, shortly thereafter the Cross worked another public miracle. The occasion, again, was a procession, this time a funeral march to the church of San Lio where a mass for a deceased brother was to be held. The late brother, however, was a dissolute person who had repeatedly refused to join the Cross-led journeys of the scuola. Challenging the divine did not go without retribution. As soon as the procession mounted the bridge in front of the church, the Cross refused to cross over, all attempts to carry it to the other side notwithstanding. The ceremony was allowed to continue only when the Guardian ordered it taken down and replaced by a simple cross from the church. The great multitude of brothers and onlookers who were to take part in the service had just witnessed yet another miracle worked by the Cross. Thus began the miracle-working career of the relic of the True Cross hosted by the confraternity of San Giovanni Evangelista. In the course of the following century it performed no less that seven other miracles, and perhaps more, all to the awe and wonder of participants and audience. The Cross delivered merchant ships from the fury of sea storms, exorcised demons, healed sick and paralyzed, and returned to health a badly wounded child. It became the confraternity’s most treasured acquisition and attracted the devotion of worshippers great and small. Its miracles were faithfully recorded in the confraternity’s books and ratified by the communal authorities. In 1414 officers of the scuola considered decorating their meeting hall with representations of the Cross’s miraculous actions Half a century later the project was already outdated. 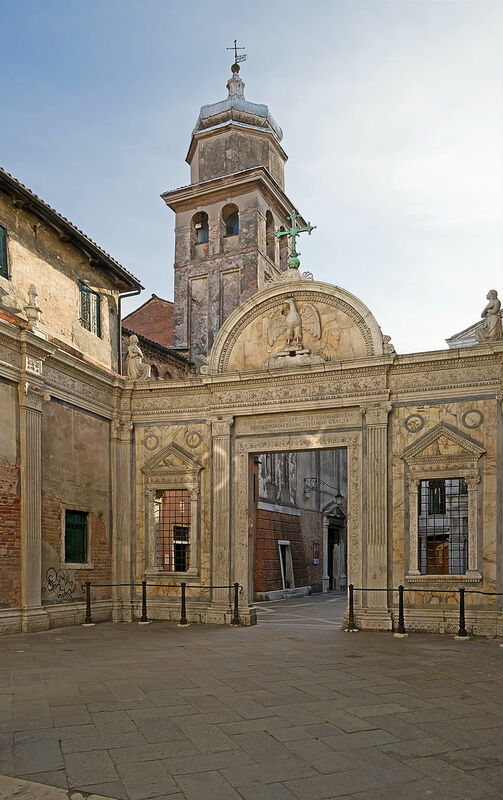 A new pictorial program was launched in 1494, which adorned the albergo with the relic with nine monumental canvasses executed by leading Venetian painters of the time. In the same decade the confraternity commissioned a limited edition of a small booklet describing the miracles. The text was reprinted with a few alterations a century later, in 1590, and from that point found its way into numerous seventeenth- and eighteenth-century miracle collections. Judging from their numbers, the confraternity’s visual and textual publicity campaign was quite effective. The relic of the True Cross might well have earned the confraternity the status of a scuola grande. It certainly contributed to its continuing appeal and position vis-à-vis the other scuole in the city. The majority of the miracles worked by the Cross and known to us have to do with healings. Such feats were (and still are) the bread-and-butter area of intervention of supernatural artifacts of all kinds. The miracles briefly summed up above, however, belong to a different category. Their stated and putative aim was for God to simply manifest himself. In an age of hunger for supernatural artifacts, the relic had to prove its authenticity to be able to reinforce the faith in the efficacious powers of the divine. The narrative logic of the textual accounts conveying the miracles and the construction of the pictorial istorie painted after them sent out a somewhat different message. Accounting for all the conventions of contemporary miracle stories and the Venetian style of narrative painting around the turn of the cinquecento, the actions of the True Cross at San Lorenzo and San Lio have specific social contexts. Through text and image, the primary goal of the renditions of the miracles was to express and affirm the status and duties of their chief protagonists and through these, the social arrangements of late medieval Venice. Stable enough but nonetheless evolving, the latter underwent noticeable changes between the early 1370s, when the Cross worked its first miracles, and 1500, when Gentile Bellini completed The Miracle at the Bridge of San Lorenzo. Remarkably enough, the social logic of the miracles’ renditions held relevant throughout the period, although for different reasons. The slices of social reality in which the miracles occurred, the execution of the new pictorial program was conceived, and Giovanni Mansueti’s and Gentile Bellini’s large canvasses were completed constitute three consecutive points on a trajectory at which the social consensus about the needs of representing the action of the sacred intersected with cultural consensus about its meanings. The analysis of the texts and images that capture these instantiations of reality allow us a glimpse into the relation between the Venetian social establishment and its cognitive aesthetics. At the starting point of San Giovanni Evangelista’s True Cross’ Venetian career is the figure of Andrea Vendramin. The privilege for the donation of the Cross to the scuola in the incunabula booklet describing the miracles states that it was because of the brothers’ reputation as devout men that Philippe de Mézières, the former Chancellor of the Kingdom of Cyprus and royal envoy to Venice, decided to donate the fragment. The fact that Mézières was hosted by the confraternity during his lengthy stay in Venice and felt obliged to reciprocate is not mentioned. Besides being a pious man, as Guardian grandeVendramin must have been one of the most prominent cittadini in Venice in the 1370s. He was a wealthy oil merchant and wholesale supplier for the soap manufacturing business his family owned and operated. His mercantile and industrial background, as well as his real estate properties were the focus of the second miracle worked by the Cross, the delivery of two of his ships laden with soap oils from a sea storm in the Adriatic Sea. More importantly, Vendramin was socially upward-bound. His wealth and reputation had already ensured him the position of Guardian grande of one of the then major Venetian confraternities, endowing him with considerable social and economic muscle in the finely structured Venetian power hierarchy. Just a few years later, as a leader of his family, he broke through the political glass ceiling of Venetian society. In 1379, to support his city in the war with Genoa, Vendramin offered to pay the expenses of thirty fighting men for two months, sent his son Bartolomeo with two companions along with a infantry man in his own place, and pledged to support a galley and two boats with the interest from his publicly invested funds «for as long as the war lasted». For this patriotic commitment, in 1381 he and his descendants were admitted to the Grand Council and become members of Venice’s exclusive ruling caste of patricians in one of the extremely rare cases of group enlargement of the patriciate after the Serrata closed the political class in 1297. The renditions of the miracle at San Lorenzo duly convey the sense of individual social mobility enveloping Vendramin’s figure and career. The intrusion of the supernatural happened at a bridge, a convenient physical trope for the social threshold that the Guardian was about to cross. The early account that described the retrieval of the Cross delineates neatly the fundamentals of the Venetian social hierarchy in a dense, long sentence, placing Vendramin, not yet a patrician at the time, at its top. 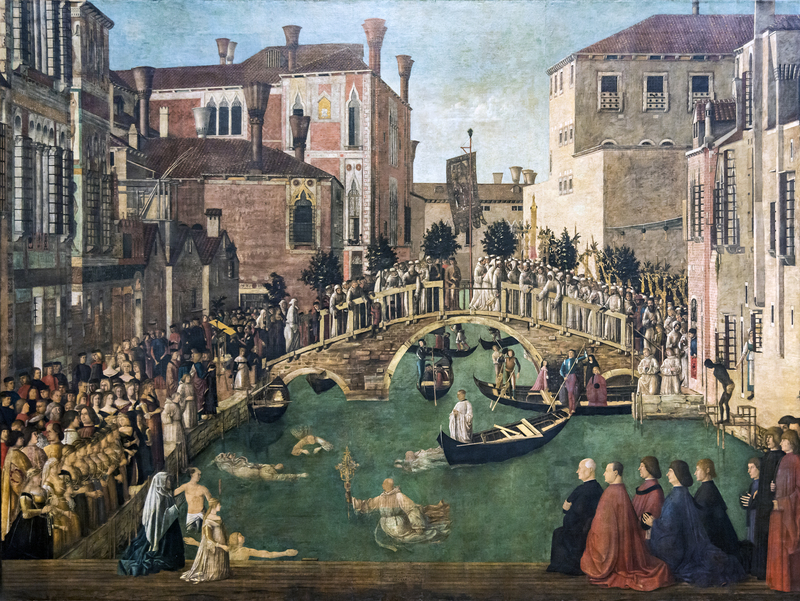 As they saw the Cross tumbling over, representatives of different Venetian social classes launched themselves in the water in three consecutive waves: first lay onlookers from the banks of the canal, then brothers from the confraternity, then a priest of the church of San Lorenzo, and finally Vendramin himself. A double hierarchy transpires here, interweaving piety and social arrangements. The escalation of effort stresses the political arrangements of Venetian society, determining status through a series of criteria weaving together secular standing and proximity, literal and mystical, to the sources of supernatural power. The onlookers, no matter their rank, lacked the status of spiritual affiliation with the collective conduit of grace represented by the confraternity. The lay brothers of San Giovanni, for their part, stood above the general public by virtue of their proximity to the Cross but lacked the official spiritual credentials of a priest empowered by the sacrament of ordination and entitled to handle numinous objects. The priest of San Lorenzo possessed a higher level of spiritual quality but was nonetheless a representative of the clerical estate and thus by definition politically subordinated to the ruling lay patrician class. 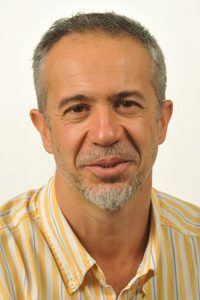 The combinations of spiritual and profane, lay and ecclesiastical, and social and political naturally positioned Andrea Vendramin at the pinnacle of the established social and political order. As the accounts have it, the divine revelation was as much a manifestation of the miraculous powers of the supernatural as it was the seal and ratification of that order. It sanctioned proper hierarchy on principle and pinpointed Vendramin as the authorized typological equivalent of the numinous agent: a choice that clearly indentified him socially with the noble class in the frame of the Venetian political theology of governance. If Andrea Vendramin was at the top of the hierarchy reflected in the unfolding of the miracle of San Lorenzo, the social status of the brother who was shamed by the Cross at San Lio is somewhat of a mystery. We do not know his name or occupation. Two things characterize his position within the scuola. First, he was molto dissoluto and cattivo, and a regular at taverns and brothels and second, he refused to follow the Cross in procession. The incunabula account reduces the miracle’s goal to the purpose of blanket unmasking and condemnation of moral failure and disrespect for the sacred, which borders on unbelief. Both were serious infringements of the ideal order of the Venetian commune and confraternal discipline, but there was more behind the reasons for the interjection of the divine into everyday space at San Lio. To begin with, it is highly unlikely that in the person of the dissolute brother the miracle would target the patriciate or seek to censure a member of the citizen elite, the cittadini originarii. The reasons are the special relationship with the divine enjoyed by the former and the restrictions imposed on the leisurely pursuits of the socially dominant classes by the state constitution. In all probability, the dissolute brother was a popolano, a commoner exercising a mechanical trade. The narrative logic of the story, the provisions of the scuola’s regulations, and the social dynamics within the confraternity and in the larger Venetian society between the late fourteenth and the late fifteenth centuries offer clues that support this conclusion and reveal layers of social meaning in the action of the divine agent. In terms of textual logic, just like at San Lorenzo’s, before it became clear what was responsible for the traffic jam on the bridge several persons attempted to get the Cross moving. Their order of involvement, however, portrays the social hierarchy highlighted at San Lorenzo’s in reverse. The first to become aware that something was amiss, perhaps some accident, was the Guardian grande. He instructed one of his «companions», therefore likely a man of his rank rather than a common brother, to take up the penello with the Cross and proceed. The companion failed. Then another person got involved, a mariner, a man robust and bold, who volunteered to carry over the Cross, confident in his strength. He too failed in his turn, «and if the first two did badly, he fared even worse», as the text comments. It is at this point that a friend of the deceased who had been well aware of the dead confratello’s failures and had tried in vain to bring him to his senses, realized what might have caused the procession to halt and reported it as a miracle to the Guardian. The account’s narrative thus establishes a clear progression of rank in a descending order, beginning with the most socially prominent personage, the Guardian, going down through the hierarchy, including the associate of the dissolute man, and ending with the culprit himself. The social conditions in late medieval Venice as reflected in confraternity practices make it even more likely that the depraved man targeted in the text was of low commoner status. Unlike the event at San Lorenzo, the miracle at San Lio is not about dynamics. At San Lorenzo, the Cross jumped in the water by itself and then continued to move of its own accord, including its final approach to the Guardian. And in the eye of the beholder, as Bellini’s artistic skill rendered it, once in the latter’s hand it was the Cross that pulled Vendramin toward the canal’s bank rather than the Guardian carrying it out of the water. At San Lio, the miracle is all about stasis: staying put, staying within limits, knowing one’s place, fulfilling one’s obligations. The bridge here is a threshold to obligations that could not be rescinded. The texts do not mention it, but leading a virtuous life and marching in procession behind the Cross at funerals were not up to the discretion of individual brothers. Piety was mandatory. It was their duty, clearly spelled out in the scuola’s mariegole, or confraternal constitutions. It was not a liability to be accepted or rejected lightly, for three reasons. First, it was part of the basic contract between the confraternity brothers ensuring each of them a larger pool of devout intercession on behalf of their souls. Second, and increasingly more important as time wore on, accompanying deceased brothers on their last earthly journey was the social duty of the commoners and poorer members vis-à-vis the well-to-do and patrician brothers who contributed the overwhelming majority of alms enjoyed by lower-class members. 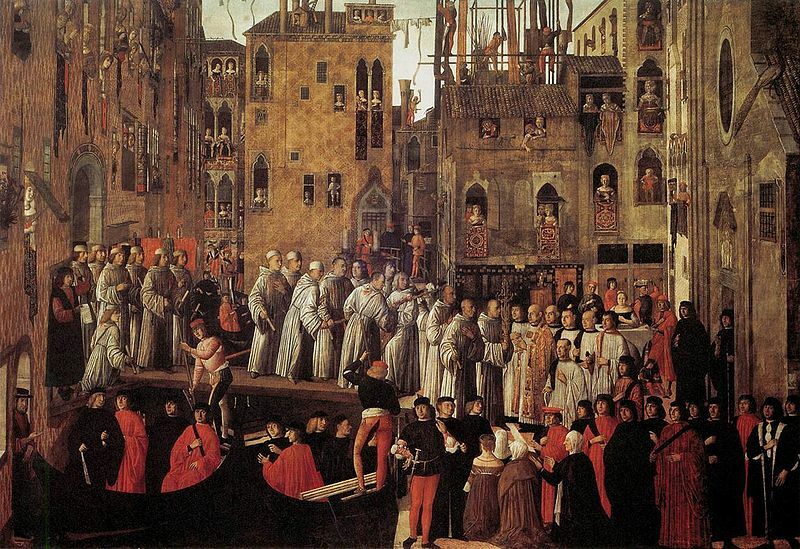 Well-attended processions illustrated the social harmony in Venice, confirmed the status of the elite, and added to the chance that they would end in God’s good books. Thirdly, the relic depended on worshippers to validate its charisma as much as the brethren depended on the relic to give a boost to their good fortunes in this world and in the hereafter. For all this to be efficacious the brothers had to live a virtuous life as the regulations enjoined it upon them. Preventing the perpetration of sin was a major goal of confraternal regulations. Misdemeanors such as gambling and drinking at taverns and conversing with prostitutes reflected poorly on the scuola’s status as a vehicle of grace that was to be distributed to the community. It diminished the efficacy of the entity. When the Cross refused to lead the miscreant to his final resting place, it was not entirely personal. By asserting itself, the divine agent also affirmed the double meaning of confraternal devotion, social and spiritual. Then again, the dissolute brother might have been lower in rank and status, but it does not appear that this put him in a position of dependence on his social betters. Despite the admonitions of his comrade, he carried on with his depraved life until the end. One can assume, and indeed that was the case, that at the time when the miracle occurred there were no social conditions, or institutional mechanisms, to enforce either virtuous life or outward expressions of confraternal piety. It took the action of the authority of the highest instance, the supernatural, to set things straight. How much of the accounts was part of the original textual rendition of the miracles with their respective exaltation of upper-class individual social mobility and stigmatization of lower class Venetians who shirked their social obligations is difficult to say. There are reasons to believe that the incunabulum of 1494-1501 might have strayed from the late fourteenth-century records, just like the reprint of 1590 introduced slight but visible alterations in what became the mainstream text in the Baroque tradition. The Guardian grande at the time of that later print mentions that «books» containing the earliest recording of the miracles have been pilfered. Even accounting for the precedent of extremely limited dissemination of information offered by the available incunabula text, his reference almost certainly indicates a scripted record in the confraternity’s private books. The most likely documents to contain the original accounts of the miracles, the scuola’s Notatorio, lacks the first fifty-two folios; the Registro di donazioni, now available in a late copy, is also missing its twenty-four beginning folios and opens with the miracle at San Lorenzo. The pilfered «books» might well have been these bundles of ripped-off pages. It is conceivable therefore, that the incunabula and the later account deriving from them enhanced the socially relevant information. Still, there is no reason to doubt the main direction of the account in the incunabula’s rendition with its focus on supernatural action emphasizing Vendramin’s individual status and confirming lower-class brothers’ collective obligations. If the incunabula account is true to the original scripted text of the miracle, it is a testimony to Vendramin’s aspirations. If the text was composed or modified after 1381 it came to ratify his noble status. The numinous agent had already demonstrated its preference to Vendramin, by choosing, through Mézières’ decision, his confraternity to host its earthly conduit, by choosing him to retrieve the relic, and by choosing to reveal itself one more time by saving him from financial loss. In whatever form these choices were embodied the preference was already an established fact by the time of Vendramin’s ennoblement. Similarly, the stern admonition threatening loss of spiritual privileges issued to the dissolute brother with the miracle at San Lio reflected long-standing arrangements linking the sacred and the social in trecento Venice. But by the later decades of the fifteenth century, as the confraternity conceived the idea of the new pictorial cycle in honor of the Cross and commissioned the incunabula perhaps, among other things, as a guide to the artists, there were more poignant reasons to stress the relevance of the miracles. The Miracle at San Lorenzo’s special attention to Andrea Vendramin made even more sense as the fifteenth century wore on. The Vendramin family continued its social and political ascent. In the 1430s-1450s Andrea and Luca Vendramin, the sons of Bartolomeo, appear among the families most frequently elected to the Senate, a testimony to their political commitment and rising prestige among the politically most active Venetian elite. Throughout the fifteenth century members of the family consistently held some of the top offices of the Serenissima. 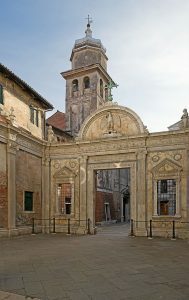 The family’s crowning achievement was the election of Andrea Vendramin, the grandson of the Guardian grande and himself a member of the scuola, as doge in 1476. The link to the Vendramins rubbed off some of their éclat onto the collective body of the confraternity as well. It is not by coincidence that Gentile Bellini decided—or was perhaps asked—to portray the Guardian Vendramin with the face of his grandson, the later doge, whom he knew personally. The interest was mutual. The family too, saw the continuing affiliation with the scuola and its precious relic as an important component of their public and civic image. In 1484 members of the family, the sons of the Doge Vendramin, Paolo and Alvise, as well as a nephew and another relative, joined the confraternity and made a real estate gift of significant value, citing the Cross and its miracle at the bridge of San Lorenzo. In 1491 Alvise’s son Giovanni followed suit. The intimate connection to the relic that the family claimed is perhaps best illustrated by Titian’s family portrait, executed ca. 1543-47, of Gabriele and Andrea Vendramin with the latter’s seven sons adoring San Giovanni’s crucifix with the fragments of the True Cross. Clearly, the older Andrea’s involvement in the miracle of San Lorenzo had become a foundation myth for the family and was a crucial component of their social position well into the sixteenth century. There are reasons to think that they felt compelled to stress that exclusive supernatural support. Regardless of their rapid incorporation in the politically most powerful and socially most prominent nucleus of the Venetian ruling class, the Vendramins were only recently arrived. Their citizen status would have hardly been forgotten against the background of the leading noble clans that could trace their genealogy several centuries back in time. In 1476 Andrea Vendramin was elected doge with a majority of only three votes. There had been significant opposition in the electors’ Council of Forty-One, overcome by his relatives among the older families. Patricians of ancient stripes openly expressed their disdain for Vendramin. A year into Andrea Vendramin’s reign, Antonio Feleto, a lawyer and a former employee of his did malign him in public by stating that the Forty-One must have been hard pressed to select a doge since they could not find anyone better than an oil vendor. These attitudes are not accidental. The last quarter of the fifteenth century saw an increasingly hardening perception of the divisions in the Venetian social hierarchy, especially the differences between the upper crust of the wealthy merchants cittadini and the patrician nobility. The latter began to emphasize more rigorously their aristocratic status and the distinctions that set them apart from even the most prominent commoners. The younger Andrea Vendramin, the future doge, was touted as «the most beautiful youth» in Venice by the second quarter of the century but his handsomeness, the service to the Serenissima, and the commercial and real estate wealth his family commanded, were apparently not considered sufficient. 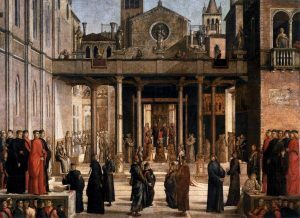 The confraternity’s decision to commission a new painting cycle in which the elder Vendramin figured prominently as the divine’s chosen personage came to bolster their position as well-established members of the Venetian political leadership as much as it was testifying to the scuola’s corporate position as conduit of God’s grace. It was fully in the spirit of the late fifteenth-century outburst of artistic and architectural energy designed to strengthen the linkages to the supernatural in what were some of the city’s darkest hours. It was also contemporary to another massive investment in the symbolic self-promotion of the family, the construction of the tomb of Doge Andrea Vendramin in the church of Santa Maria dei Servi. Executed by Tullio Lombardo in 1493-94, ever since it was built the tomb has been considered the most important funerary monument and the benchmark of the architectural and artistic sophistication of late fifteenth-century Venice. Between them, the cognitive aesthetics of Lombardo’s sculptures and Bellini’s painting constructed a visual reality that proffered a solid proof to the greatness of Venice, the devotion of its people, the divine grace lavished on them, and the role of the Vendramins as the human linkage between all of these. If the Vendramins felt somewhat on the defensive against the background of late fifteenth-century social adjustments the investment in the artistic projection of their rank and status provided unshakable testimony for their belonging to the Venetian chosen elite, figuratively and literally. Even if they felt secure enough in their position after Doge Vendramin’s election, an artistic tour de force was in synch with the general mood of the time. As refined contemporaries knew, beauty was efficacious, miraculous beauty even more so. How about the miracle of San Lio? The later decades of the fifteenth century witnessed developments with significant impact on the confraternity brothers of lower extraction. The 1490s were especially disturbing. Hard pressed in the Mediterranean and with trouble brewing in the terraferma, Venice saw a slump in its commercial activities and massive loss of wealth for the state and the ordinary citizens. The poor brothers of San Giovanni Evangelista, like those of the other great confraternities, became increasingly dependent on the well-to-do and wealthy. The corporate spirit of equality came under pressure with corresponding effects on confraternal devotion, which has been waning throughout the course of the fifteenth century anyway. In the earlier part of the 1400s however, it has been also the upper classes and the patrician elites shirking their obligations, as the scuola complained to the Council of Ten. By the last quarter of the century the situation had changed decisively. The poorer brothers, however defined but certainly lower class, had only one way to pay back for the charitable contributions doled out on their behalf, by participating in the funeral processions honoring their deceased corporate benefactors and by reciting prayers for their souls. The confraternity officers were well aware of the problems that poorly attended processions created for the scuola and seized on what was the easy solution. Poorer brothers depending on corporate charity may not have been too pious, but they could not afford to lose their alms. They could be, and were, transformed into indirectly paid mourners for the well-to-do. Already in 1430 the scuola’s officers were authorized to withdraw support from poorer brothers on corporate dole who failed to appear at four processions. In 1490 the Council of Ten authorized the scuola to impose attendance at funeral processions on all those who received alms and benefices or held probationary status on pain of losing the benefits or the chance to join. The miracle at San Lio was a stern reminder of that obligation and a testimony of its growing importance within the confraternity. It can be argued that the scuola’s concern precisely with that problem was behind the petition to the Council of Ten to authorize the resumption of the procession to the church of San Lio to commemorate the miracle, approved in 1475. Among other reasons that cannot be well ascertained the same preoccupation may be lying behind the fact that the painting with the miracle at San Lio was one of the first to be executed, ready to be hung in 1494..
And yet, exactly at the point when corporate charity mattered so much more for the rank and file brothers who fell on hard times, two developments took place that must have affected their morale. First, the officers of San Giovanni Evangelista and their counterparts in the other scuole reduced support for charity to dedicate funds to their lavish redecorating campaigns. The governing body first attempted to meet the rising expenditures by signing up more members. In 1478 it became known that the scuola had enrolled over 200 people in excess of the legal number of 550. The Council of Ten immediately mandated their dismissal. By the early 1490s, the situation had changed. In February 1491, the scuola humbly petitioned for an expansion, and the Council of Ten duly granted their request to that effect. It soon became clear that that would not suffice. In September 1492, the Council had to authorize the suspension of an annual charitable distribution to secure additional funds to the tune of 200 ducats per year. The partial reorientation of confraternal spending may have been spiritually well justified in the eyes of the confraternity officials, but the effect of those cuts on corporate morale cannot be overlooked. Second, even as corporate spending augmenting poorer members’ resources was being pared down, the Ten allowed preferential treatment of noble confraternity members. In 1481, it went so far as to order the scuola to enroll gravely sick and even already dead patricians who desired to obtain the spiritual benefit of such affiliation. Since 1409, nobles had enjoyed special treatment in monetary terms as well, since the Council of Ten had postulated that they were not liable for the ten ducats entrance fee and were to pay whatever they considered fit. The patricians evidently used this provision as an excuse to cut down on their contributions, putting the confraternity under financial stress. In 1498, some time after the incunabulum with the miracles was printed and four years after Mansueti painted the miracle at San Lio, the magistracy reinstated the entry fee for nobles at a minimum of ten ducats, the standard amount for commoners of all stripes. The Ten repeated the injunction in 1505, which indicates that the nobles resisted paying even that. Such developments could not have failed to generate resentment in the rank and file membership of the scuola. The confraternal climate was ripe for recalling the miraculous intervention at San Lio. As the narratives have it, the transgression that drew the ire of the supernatural was not so much the dissolute brother’s depraved life, nor his refusal to march in any procession, but his refusal to attend specifically funerals. His friend’s argument juxtaposes the eventual attendance of the cross upon his death to the confratello’s current obligation while alive. On the principle of reciprocity that informs so much of the scuole’s existence in the Venetian social and spiritual worlds, the structural logic of the miracle points to shirking attendance at funeral processions as the brother’s main failure. The obligation that he neglected was more confraternal than civic and was therefore required of him not because of his position as a citizen of Venice but due to his rank and status as a member. Given that attendance at funerals had become an institutionalized marker of (lower) social status the action of the numinous came to seal that status by stressing that processions were his duty and not a freely taken liability to accept or refuse at will. The textual renditions of the miracles of San Lorenzo and San Lio therefore, the supposed prototype in the confraternity books and the incunabula, dovetail well with the principal premises and shifts in the social constitution of the city in the later fourteenth and fifteenth centuries. There are reasons to think that the «virtual covers» and alternative proofs for the veracity of the texts, the authenticity of the miracles, and the efficacy of the relic, the large canvasses executed by Gentile Bellini and Giovanni Mansueti, had a similar social underpinning. The reference point here, however, is not the confraternal arrangements or the Vendramins’ and the dissolute brother’s respective social aspirations or failures. It is Bellini’s and Mansueti’s own status and position as members of the profession and Venetian citizens. It appears that the canvasses, while reflective of the painters’ individual style, skill, and artistic preferences, allow for a conjecture that establishes a socially informed correspondence between their status and career and the meanings embedded in their renditions of the miracles. This is a tenuous argument that has not been broached by art historians but is definitely worth hazarding. If apposite, it allows for yet another dimension of the composite perception of what happened at San Lorenzo and San Lio. By the time he was commissioned to paint the miracle of San Lorenzo, Gentile Bellini was at the peak of his life as an artist and member of the respectable upper-class Venetian society of the later fifteenth century. He had had a remarkable socially upward career, considering the origins of the family whose scion he was. 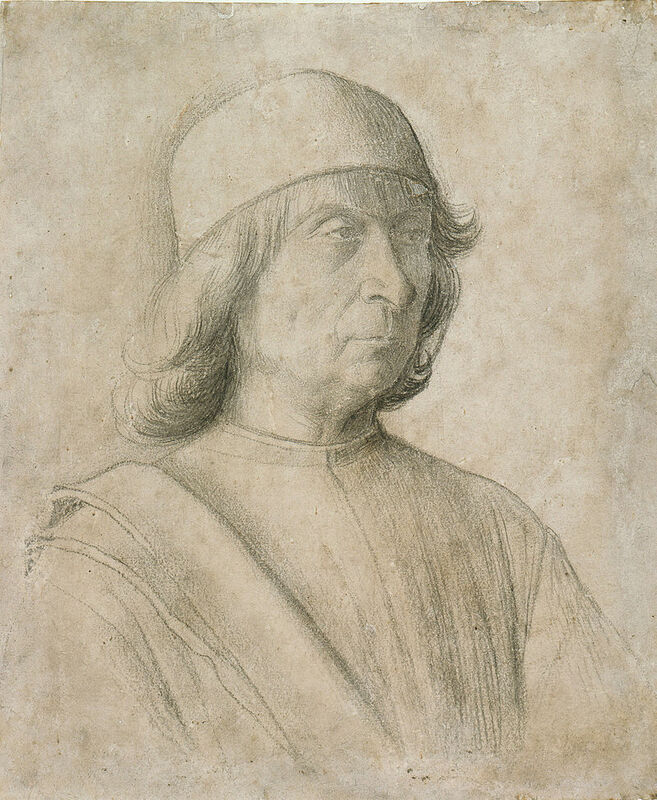 His father Jacopo Bellini, who established the Bellini’s reputation as foremost artists and masters of one of the two recognized painting workshops in the city, began as the son of a tinsmith who was perhaps not even a native of the city. The ancestry of manual work would have defined Jacopo as a popolano but his talent guaranteed him the status of cittadino. Gentile ploughed ahead in the same spirit. When he took over from his father at the latter’s death, probably in 1469, he had already been granted the honorific title of Palatine Knight by Emperor Frederick III for undefined services. Four years later, he was put in charge of the restoration and repair of the decorative program of the Great Council’s hall, a commission greatly adding to his honor. In 1479 he received another knightly title, «Golden Knight», accentuated by the gift of a heavy gold chain from the Ottoman Sultan Mehmed II and proudly displayed it on a medal he struck himself. The Grand Council addressed him as fidelis civis noster. For the grandson of a popolano tinsmith, Gentile was doing quite well indeed. Gentile’s artistic style, of which the canvasses for San Giovanni Evangelista’s miracle cycle are a good example, mirrors typologically his and his family’s life experience as upward-bound persons. The latter fact corresponds, on a fundamental level, to the socially mobile career of the Vendramins. The only difference was that their families started their ascent at a different rung of the social ladder. Both, however, were able to climb to the respective limits of their social progression. In Gentile, the Bellinis reached as far as they were allowed to, only the very top of Venetian society being off limits for them. 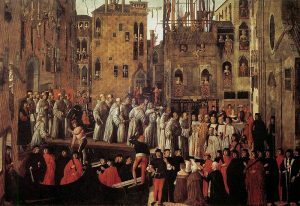 It is perhaps not just a coincidence that Gentile chose to portray his synopsis of Venice, the great procession in the piazza San Marco, with the cathedral’s top cut off. As for the Vendramins, by virtue of their head start the sky was the limit. It will therefore not be too much of a conjecture to state that Gentile’s rendering of The Miracle of the Bridge at San Lorenzo bears the marks of his artistic sensibility in manner, color, style, and composition as much as it does embody the particulars of the social reality of his being in the world. It is bright, open, and airy. A generous amount of light pours onto the wide-open scenery. It is well centered around the figure of a heroic individual, in this case the Guardian grande Andrea Vendramin. The rendition is dynamic, with a winding double perspective and considerable amount of energetic movement enfolding into a relatively open space. It provides an ample amount of room around the central figure to move. It includes a temporal perspective conveying perhaps as many as three moments of time connected to the miracle. It leads the eye, from the focal point of Vendramin and the Cross, to the stone bridge in the background with the massed confraternity brothers at the middle of which the crowd parts to highlight three figures standing for the topmost ranks of the Venetian social hierarchy, a noble, a knight, and a senator. Just in front of them, staying put, is the scuola’s standard, drawing the eye up, where the sky opens. The perspective on the architecture around the scene makes the action appear to enfold outwardly. The buildings, the bridge, and the canal support rather than organize or constrict the space where the action takes place within their hard-defined flat surfaces, corners, and edges. Windows on all floors and around the scenery are thrown wide open or un-shuttered. The painting also stresses the exceptionality of its central figure. Right in the middle of the frenetic activity to retrieve the Cross, Vendramin appears to advance unperturbed and with decorum, as a true patrician should. The confraternity brothers and the onlookers in the scene that appear cognizant of what had just happened are all animated and in motion. Some point to the Cross. Others gesticulate, raise their arms, or kneel in prayer. Gondoliers take off their hats or turn their eyes upward to the heavens to acknowledge the extraordinary phenomenon. In the middle of all this, Vendramin calmly floats forward holding the Cross aloft, his white robes trailing behind, with hardly a ripple disturbing the calm surface of the water. The brothers who attempted to retrieve the Cross swim toward the relic, pushing forward with mighty arm strokes. Vendramin, in just as deep water, proceeds regally, his body upward, halfway out of the water, apparently supported by the Cross which propels him smoothly toward the embankment. There, Caterina Cornaro, the Venetian-born Queen of Cyprus devoutly gazes his way, providing both eyewitness proof for the miracle and the aura of top nobility toward which Vendramin strives effortlessly. Gentile Bellini’s conceptualization of the Miracleimparts on the miraculous occurrence a meaning that made Vendramin’s figure, and all that it stood for, central for the entire cycle of canvasses on the miracles of the True Cross: at least that is what no less a connoisseur than Giorgio Vasari concluded after surveying the paintings in the 1560s. The entire impression conveyed by Bellini’s style, color, and composition is of an environment informed by openness, dynamism, and advancement. Decorum and structure afford a central and evidently chosen figure ample opportunity to unobstructed «arrival» in space, time, and society. The conclusion that the artist came to interpret the theme with his existentially determined «baggage» suggests itself logically. The Miracle at the Bridge of San Lorenzo can well be read as an aesthetic metaphor for both Gentile Bellini’s and Andrea Vendramin’s artistic and social careers, exquisitely crafted by the former and accomplished in full by the latter. Their personal progressions may not have been exactly miraculous but they were certainly blessed by the divine. To use Erving Goffman’s concept, Bellini’s artistic style «keyed» the rendition of a miraculous action from a century earlier in a different register, patterning its perception within the semantic field of Vendramin’s ascent because it was a typological equivalent to his own social experience. Giovanni Mansueti’s Miracle at San Lio could not have been more different, and more apposite to the meaning embedded in the story of the miracle. The painting, along with a second piece he did for the True Cross cycle, The Healing of the Daughter of Nicolo di Benvegnudo, appears to have been his first major assignment. The commission won him another important patron, the scuola of San Marco, which hired him to work on their own decorative project. Too little is known about Mansueti to venture a guess why the scuolaof San Giovanni entrusted him with this task. The association with the Bellinis must have played an important role. Mansueti had been an apprentice in their workshop and maintained a life-long affiliation with Gentile and Giovanni even after receiving major commissions. It seems that he needed that connection. All of his known work shows the expertise of a craftsman, a careful, well-articulated artist with a good deal of skill but little imagination and none of the creative, inventive touch characteristic of the great talents. For most all of his large painting there are preparatory drawings made by someone else’s hand; Mansueti followed them, to the extent he was capable. His artistic ability was limited, and he appears to have known and acknowledged that. For all practical purposes he was a man of mediocre talent, secure in his niche but under pressure, consistently outdone and overshadowed by others, first by his masters, then by his peers, and ultimately by painters of the younger generation, such as Giorgione and Titian. He had not much taste for the sublime. His strength was in conveying mundane, everyday features. In his waning years, in the late 1520s, his major patrons became increasingly uncomfortable with his work; his heirs had to have recourse to a drown-out litigation to recoup some of the wages promised to him by the scuola of San Marco. He was successful in terms of staying busy but his life had none of the luster, glamour, and socially ascending trajectory of Gentile’s position in the larger Venetian society. Stability, conservatism, and even stagnation characterize Mansueti’s place in the contemporary artistic community. At the time he began the work on the Miracle at San Lio Mansueti had already developed his identifiable style. Its chief features are unmistakable in the painting and are even more pronounced if compared to a drawing attributed to the hand of Gentile Bellini and likely prepared for the painting of the miracle. Gentile’s sketch is airy and light, almost serene, bearing his hallmarks of openness and decorous movement. By contrast, Mansueti’s canvas depicts one of the most crammed and condensed spaces he ever painted. The scene is overcrowded, Mansueti’s typical visual garrulity bursting it along the seams. His desire to fill space translates in a pictorial agoraphobia. The painter altered the architectural topography of the square in front of San Lio, bringing in a bridge closer to the church, making the buildings in the rear background close in on the spectator and the houses on the left and right towering menacingly above the bridge. Mansueti’s concern for architectural detail is overwhelming. So are his human figures popping up from every window, door, roof, or balcony, massing in open spaces, and floating in gondolas and boats from which one cannot see the water of the canal. A ribbon of black-clad patricians and senators in red togas populate the foreground, in stark contrast to the white-robbed confraternity brothers, which they visually separate from the viewer. Dynamics, perhaps attempted, eludes the spectator. Except for architecture perspective is lacking, layers of people compete for the beholder’s attention. The overwhelming impression is that of an overcrowded, condensed reality, with little if any room to move, the visual tale of an arrested progression. Which is precisely where Mansueti was situated, socially and artistically, in 1494. His rendering of San Lio’s miracle main message within the framework of abundant architectural and structural detail construes his metaphor of contemporary Venetian society and his place in it. It was an overwhelming order, but also a comforting one. It was congested, but since everyone was in their proper place there was not much chance that someone would get elbowed out. In society, like in the architectural frame which he so delighted in depicting, every detail mattered. Even the smallest part of the order had a functional task, conveying beauty, supporting action, or providing testimony. Nothing could be subtracted or taken out without affecting the efficacy of the whole. For a lame painter with average skill, quite conscious of his limitations, the message of the miracle of San Lio was a solid guarantee that ratified his status in the world. His canvass captures the moment after the miracle had occurred. The numinous agent had sanctified the order «as is» with Mansueti’s place in it. In case there was any doubt, the artist duly portrayed himself affirming his faith: not just in the charisma of the sacred object and the shame of the miscreant, but in the numinous action that confirmed his belonging as well. The short analysis of the meanings inherent in the fifteenth-century renditions of the miracles at San Lorenzo and San Lio offered here is certainly not exhaustive. Nonetheless, it illustrates the degree to which the perceptions of «what actually happened» when the supernatural broke into everyday life result from the social strategies and being in the world of the main characters, individual and collective, which constructed the records that commemorated the occurrence. Against such a background, the designs of the main actor, the numinous agent itself, sink in the complex web of strivings for continuous re-arrangement of the relationships between individual, group, and society in late medieval and Renaissance Venice, to remain an almost complete mystery. Which, after all, they are supposed to be. Incunabulum in the Museo Civico Correr, cat. 249 (no title, incipit, Miracoli della croce nella benedetta scola de misier san Zuane evangelista). The second text is Miracoli della Croce Santissima Della Scuola de San Giovanni Euangelista, Venice, Ventura Galuano, 1590. The first miracle can be dated in the 1370s by the presence of Andrea Vendramin, who passed away in 1382 and occurred, in all probability, in March 1370. The second miracle is harder to date. It most likely took place in the last years of the fourteenth or the first decade of the fifteenth century, assuming that the miracle collection, which places it before the miracle with the healing of the daughter of Nicollo di Benvegnuto (dated in 1414), is arranged chronologically. Archivio di Stato di Venezia, San Giovanni Evangelista (ASV SGE), Registro 140, f. 70v, November 4, 1414. For a most thorough recent discussion of the pictorial cycle against the background of the age along with copious references to earlier works see P. F. Brown, Venetian Narrative Painting in the Age of Carpaccio,New Haven and London, Yale University Press, 1988. The dates for the completion of the canvasses are after J. Bernasconi, «The Dating of the Cycle of the Miracles of the Cross from the Scuola di San Giovanni Evangelista», Arte Veneta,35, 1981, p. 198-202. First discussed by P. F. Brown, «An Incunabulum of the Miracles of the True Cross of the Scuola Grande de San Giovanni Evangelista», Bollettino dei Civici Musei Veneziani d’arte e di storia, new series, 27, 1-4, 1982, p. 5-8. The magisterial study of the social policies of the Venetian confraternities remains B. Pullan, Rich and Poor in Renaissance Venice: The Social Institutions of a Catholic State to 1620,Cambridge, Massachusetts, Harvard University Press, 1971. For a succinct recent survey see P. F. Brown, «Le Scuole», Storia di Venezia. Dalle origini alla caduta della Serenissima, vol. 5. Il Rinascimento. Societa ed economia, ed. by Alberto Tenenti and Ugo Tucci, Rome, Istituto della Enciclopedia Italiana, 1986, p. 307-354. For the art-related activities of the confraternities see W. B. Wurtmann, The Scuole Grandi and Venetian Art, 1260-c. 1500,Diss., The University of Chicago at Illinois, Chicago, 1975. Not much is known about Andrea Vendramin. By 1351 the Senate allowed him to begin trading in soap oils due to heavy losses incurred during recent political disturbances, see ASV, Senato, Misti, vol. 26, fol. 53r, March 10, 1351, quoted after Benjamin Kohl, The Records of the Venetian Senate on Disk, database, 2001, Kohl Nr 1523. Apparently, he made a fortune in the business and the quality of the soaps produced by his family became proverbial. In 1458 Benedetto Cotrugli, a merchant of Ragusa (Dubrovnik) well-versed in the Venetian and international trade states in his Libro dell’arte di mercatura that the Vendramin soaps were so good you could buy them «a chiusi occhi», see Ugo Tucci, ed., Benedetto Cotrugli Raguseo. Il libro dell’arte di mercatura, Venice, Arsenale Editrice, 1990, Book I, chapter 17, p. 178. Vendramin’s funerary inscription informs us that he was the son of Luca, died on August 25, 1382, and was buried in the grounds of Santa Maria dei Servi where his grandson, the Doge Andrea Vendramin, later had his own funerary monument, see E. Cigogna, Delle inscrizioni Veneziane, Venice, 1824, p. 46-47. For his patriotic contribution see Vittorio Lazzarini, «Le offerte per la guerra di Chioggia e un falsario del Quattrocento», Nuovo Archivio Veneto, 4, 1902, p. 207. As stated in the scuola’s regulations, chapters xvi and xxi, see AVS SGE busta 32, fol. 207v. See P. F. Brown, «Honor and Necessity: The Dynamics of Patronage in the Confraternities of Renaissance Venice», Studi Veneziani,13, 1987, p. 184-92 and on the mutual relation between sacred object and worshippers R. Trexler, «Ritual Behavior in Florence: The Setting», Medievalia et Humanistica,4, 1973, p. 128sq. Miracoli della Croce santissima, Privilegio, no page. See also Brown, Incunabulum, p. 8. Data in A. Muzzato, «Problems and possibilities of constructing a research database. The Venetian case», Storia di Venezia. Rivista, vol.II, 2004, tables on p. 29-30. 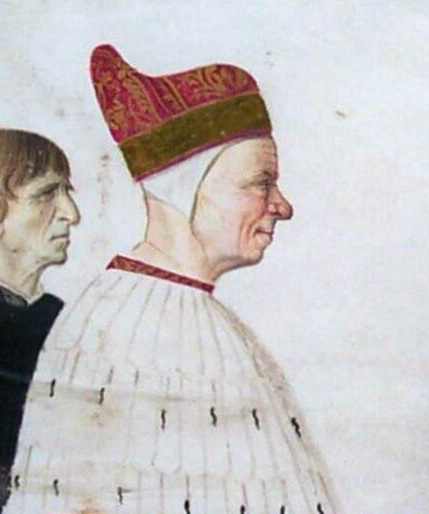 See the database The Rulers of Venice, 1332-1524. Interpretations, Methods, Database. Compiled by Benjamin Kohl, Antonio Muzzato, and Monique O’Connell, version 4.0, 2.26.2009, an e-book available at http://rsa.fmdatabase.com/fmi/iwp/cgi?-db=venice4-0 intact&-loadframes. A miniature in the Boymans Museum in Rotterdam portraying Doge Andrea Vendramin bears marked resemblance to the face of the elder Vendramin. The painting, Portrait of a Doge, Cardinal, and Secretary was done by an artist in the Bellini’s workshop and the face might have been painted by Gentile Bellini’s himself, see F. Heinemann, Giovanni e i Belliniani,Venice, 1962, p. 616. H. Collins, «Time, Space, and Gentile Bellini’s The Miracle of the True Cross at the Ponte San Lorenzo (Portraits of Catherina Cornaro and Pietro Bembo)», Gazette des Beaux-Arts,6thseries, 100, 1982, p. 201-208, noted the identification (see p. 206 n. 2), but his argument of three or even four temporal planes in the painting is tenuous. ASV SGE, Instrumenti, 89 (1324-1666), fol. 86. P. Pouncey, «The Miraculous Cross in Titian’s ‘Vendramin Family’», Journal of the Warburg and Courtauld Institutes,2, 1938-1939, p. 191-193. For the portrait see H. Wethey, Titian. Vol. 2. The Portraits,London, 1971, fig. 136-140. According to Sanudo, the election was outright flawed, see Angela Caracciolo Aricò, ed., Marin Sanudo il Giovane, Le Vite dei Dogi (1474-1494), Padua, Antenore, 1989, vol. I, p. 67. Filippo Tron, Vendramin’s major opponent and a member of one of the ancient patrician families directly stated that Andrea Vendramin was not qualified to be a doge, since he had only been ennobled in the aftermath of the war of Chioggia, ibid., p. 70. Domenico Malipiero, Annali Veneti dall anno 1457 all 1500, ed. by Francesco Longo and Agostino Sagredo, Parte quinta, Archivio storico italiano, 1st series, 7: 2, 1844, p. 666-667. Malipiero and Sanudo record that Feleto used the word caxaruol, which can mean food-seller or cheese-monger as well, but was used by the office of the Ternaria mostly to designate oil vendors. Feleto surely vented a common sentiment, but paid for the indiscretion with two years in prison and banishment upon release. He ended his life in exile. For the rapid accumulation of substantial real estate properties by the fraterna of Andrea and Luca Vendramin in the middle quarters of the fifteenth century see E. Crouzet-Pavan, «Sopra le acque salse», Espaces, pouvoir et société à Venise à la fin du Moyen Âge, Rome, Istituto storico italiano per il medio evo, 1992, p. 427-428. It is at least indicative that the second miracle of the Cross related to Andrea Vendramin and concerned chiefly with the saving of his oil-laden ships at sea tells also how he was alerted to the trouble on the water while asleep and dreaming about a blaze that was consuming his house in Venice. For Doge Vendramin’s tomb see W. S. Sheard, «Sanudo’s List of Notable Things in Venetian Churches and the Date of the Vendramin Tomb», Yale Italian Studies, vol. I, 3, 1977, p. 219-68. ASV SGE, Parti Miste, busta 41, fol. 34, petition to the Council of Ten dated March 27, 1430. On the relations between San Giovanni Evangelista and the Council of Ten see W. B. Wurthman, «The Council of Ten and the Scuole Grandi in Early Renaissance Venice», Studi Veneziani, 18, 1989, p. 15-66. See the often-quoted statement of the Guardian grande of San Rocco that the confraternities were «making one a son and another of stepson of misser San Rocco when all should be equal sons», in Brown, «Honor and Necessity», p. 196. On the other hand, the confraternity made sure they will receive enough alms by limiting the latter only to members of the scuola in 1467, ASV SGE, busta 32, fol. 12v. ASV SGE, Parti Miste, busta 41, ibid. Ibid., busta 8, filza 82, fol. 40-41. For a discussion of the process see Pullan, Rich and Poor, p. 70-78. ASV Consiglio di Dieci, Parti Miste, Registro 18, fol. 69, from May 1474. The approval came some months later, in 1475, see ASV SGE, Parti Miste, busta 41, fol. 66. Of course, this could also be due to competition with the Scuola grande of Santa Maria della Carità, which had obtained its own fragment of the True Cross in 1472. Importantly, however, San Giovanni Evangelista’s immediate reaction in 1472 was to petition the Council of Ten for permission to take the Cross out on the feast day of San Lorenzo, thus commemorating the miracle that initially and decisively established the Cross’s reputation as a sacred object. P. Brown, «Honor and Necessity», p. 194, states that the new supplication is surprising, but in the light of the social need to secure poorer brother’s attendance it is not really startling. I would argue that the two petitions were finely calibrated to meet different needs. Ibid., Registro 19, fol. 101-102. Ibid., Registro 24 (1488-1490), fol. 205, ibid., filza 6 (1492), fol. 164. Ibid., Registro 20, fol. 57. Ibid., Registro 9, fol. 25v. Ibid., Parti Miste, Registro 27, fol. 218; Registro 30, fol. 200r. See J. M. zur Capellen, Gentile Bellini,Stuttgart, Franz Steiner Verlag, 1985, p. 1-38 for Gentile’s curriculum vitae and ibid., p. 79-80 for the San Lorenzo painting for San Giovanni Evangelista. Jacopo Filippo Foresti, the prolific chronicler, mentions that Gentile was born in Padua. The reference may be just to the accident of birth, since Jacopo had worked in Padua, but it may also indicate the family’s Paduan provenance. See Brown, Narrative Painting, p. 55. Cited after Brown, Narrative Painting, p. 235-236. Erving Goffman, Frame Analysis. An Essay on the Organization of Experience, Cambridge, Mass., Harvard University Press, 1974, p. 45. For Mansueti see S. Miller, «Giovanni Mansueti, A Little Master of the Venetian Quattrocento», Revue roumaine d’histoire de l’art, séries beaux-arts,15, 1978, p. 77-115. For a discussion see Miller, «Giovanni Mansueti», p. 81 and Brown, Venetian Narrative Painting, p. 152-3 for Mansueti’s «copious style» and ibid., p. 154 for a reproduction of Bellini’s drawing for the San Lio painting. Originally published by Cahiers de recherches médiévales et humanistes 19 (2010, 267-282) under an OpenEdition public access license, republished for educational, non-commercial purposes. This entry was posted in History, Medieval, Middle Ages, Religion. Bookmark the permalink.